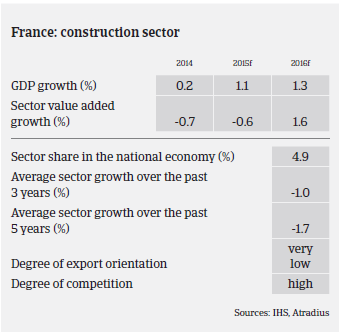 In the French construction segment revenues and investments remain low, competition is fierce, and prices and profitability are both being squeezed. Construction accounts for 4.9% of French GDP, with 540,000 companies employing about 1.5 million people. The sector consists mainly of small businesses (about 95% of construction businesses have 1-10 employees), with just about 200 companies employing more than 200 people, and some larger, internationally active players like Bouygues, Vinci and Eiffage. According to the French builders association FFB (Federation Française du Bâtiment), in 2015 French construction activity continued to deteriorate (down 3% in volume), the seventh year of decrease since the major recession of 2008. The sector was negatively impacted by still sluggish economic growth (0.2% in 2014 and 1.1% in 2015), low household purchasing power (due to persisting high unemployment and unfavourable fiscal measures) and public budget spending constraints – all hampering construction investment. According to FFB, new residential construction output decreased 3.9% in volume in 2015, with the number of housing starts remaining low. In the non-residential subsector public construction decreased 18%, while the private segment recorded a 6.6% decline. The level of activity, employment, backlog and production capacity remained very low compared to the long-term average. 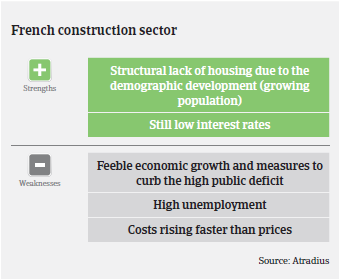 Given the poor construction performance and low demand in previous years, it comes as no surprise that French construction businesses face many difficulties. Revenues and investments are low, competition is fierce, and prices and profitability are both being squeezed. Major players keep putting pressure on their subcontractors, and banks remain very selective with their loans, making access to short-term credit difficult. Additionally, the financial situation of construction businesses is often impacted by the ‘scissor effect’ of low margins and long payment delays. The adverse market conditions with strong competition and feeble demand prevent companies from price increases, while high personal costs weigh on businesses´ budgets. Due to continued difficult access to short-term credit facilities, cash management remains a major issue. In 2015 both non-payment notifications and insolvencies increased further. In 2016, construction output is expected to rebound 2.5%, with residential construction activity expected to grow 5.5%, helped by government support for new buildings and modernisation (e.g. tax exemptions and reductions for real estate investors and first-time buyers and VAT reduction for finishing) and increasing loans for real estate acquisitions by private households. That said, non-residential construction activity is expected to remain subdued, especially in the public construction segment. Public works will likely continue to suffer from poor investments: The government has reduced funds allocated to local authorities by nearly EUR 12 billion from 2015 to 2017 (approx. EUR 4 billion per year) as part of an overall cost cutting program of EUR 50 billion over three years to tackle the public deficit. Maintenance, renovation and repair are expected to increase 0.4%. 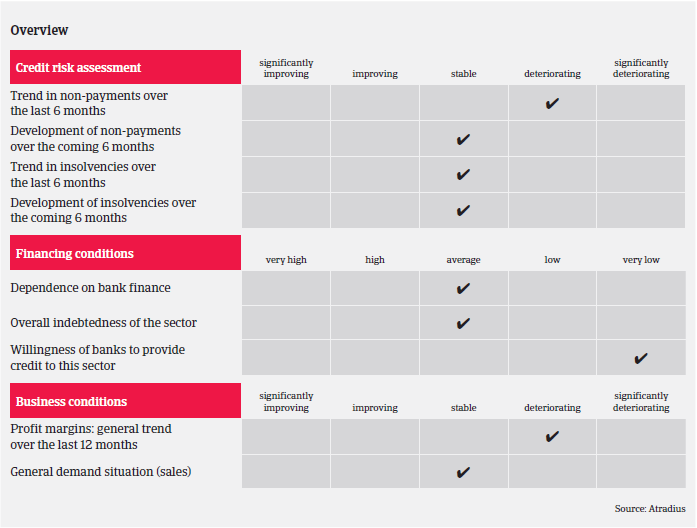 While both non-payment notifications and insolvencies are not expected to increase further in H1 of 2016, their level will remain high. Despite the expected rebound, we must remain cautious in our underwriting stance, but we still provide cover to our customers whenever it is reasonable and prudent to do so. We closely monitor and review buyers to anticipate potential high risks to our customers. We focus on the cash situation and loan facilities available to buyers, especially smaller and mid-sized companies. Several key financial indicators must be analysed: the level of activity, margins and ability to fund working capital requirements. High financial costs are a key indicator of potential pressure on cash. The French food sector has benefited from falling raw material prices and a weaker euro, which helps boost competitiveness abroad.